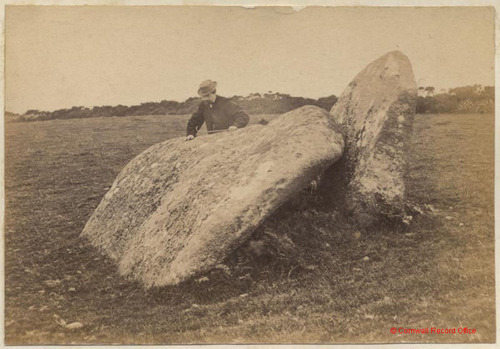 The fallen cromlech known as Lower or West Lanyon Quoit was discovered about the year 1800 by the owner of the Lanyon Estate in Madron. William Cotton quotes the following from p228 of Archæologia, Volume xiv: "The gentleman who owns the estate of Lanyon happening to be overtaken by a shower of rain, in walking through his fields, took shelter behind a bank of earth and stones; and remarking that the earth was rich, he thought it might be useful for a compost: accordingly he sent his servants soon after to carry it off; when, having removed near one hundred cart-loads, they observed the supporters of a Cromlêh, from which the covering stone was slipped off on the south side, but still leaning against them. These supporters include a rectangular space, open only at the north end, their dimensions being of a very extraordinary size; viz. that forming the eastern side being 10 feet 6 inches long; that on the west 9 feet, with a small one added, to complete the length of the other side; and the stone shutting up the south end being about 5 feet wide. The cover-stone is about 13 feet 6 inches by 10 feet 6 inches; but its length, and the height of the supporters cannot be exactly ascertained, as they are inserted in the ground; the present height being about 5 feet. "1 Image courtesy of and © Cornwall Record Office.